For the Improv Challenge this month, Kristen at Frugal Antics of a Harried Homemaker, challenged myself and fellow bloggers to make a recipe using bananas and nutmeg. Since I absolutely adore using nutmeg in my cooking and baking and I eat bananas practically every day in my breakfast smoothies, I was so excited for this challenge! After much deliberation about what to make - banana nut bread, pancakes, bread pudding, french toast, bananas foster - I decided to combine a classic breakfast recipe with a classic dessert recipe. Enter, Bananas Foster French Toast! In a shallow dish, whisk together the eggs, half and half, cinnamon, nutmeg, and sugar. Take your bread slices and dip them in the egg mixture. Flip them over to coat the other side and let soak for about a minute. Melt the butter in a skillet to grease and coat, and then add the battered slices of toast to the skillet. Let cook for about 2 minutes on each side, or until golden brown. Remove from the skillet and set aside on a serving dish. Then, in a separate saucepan, prepare the bananas foster. Melt the butter in a saucepan and stir in the brown sugar, syrup, and flavoring (if using). Once the sugar has dissolved, carefully add in the bananas and let cook for a couple of minutes while the sauce begins to boil and thicken. Make sure to coat all of the bananas with the sauce. After a couple of minutes, carefully spoon out the bananas and a little of the sauce, and pour them over the french toast. Serve immediately and sprinkle with some chopped walnuts or pecans for a little crunch! Enjoy! Such a delicious way to start the day. Who could resist such a great breakfast? Wow! 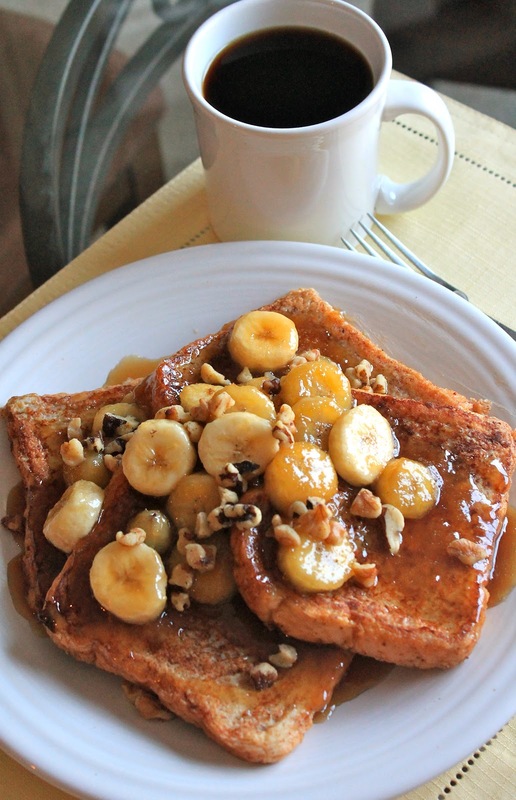 This french toast sounds fantastic... Love all that syrupy goodness with the bananas over the top of that bread. This is my kind of breakfast! Yum! What a delicious looking breakfast! I'm your newest follower via GFC. Come visit me over at My Sesame Seed Buns sometime! They look fantastic. I think I'll try these this Sunday for Breakfast-Thanks for sharing. Oh my word, looks delicious!! 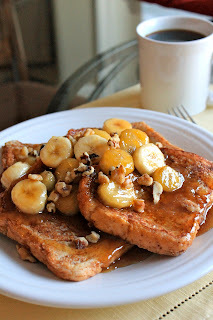 I adore bananas foster and Texas toast french toast, what a gorgeous combination. My Improv Cooking Challenge entry this month: Baked Bananas, hope that you'll stop over and check the recipe out. This looks so elegant. It could easily be served at one of the fancy restaurants in the French Quarter of New Orleans! I really enjoyed reading about it and like how the sauce from the bananas forms the traditional syrup for the toasts. Thank you for sharing the recipe. I made banana daquiri muffins, I hope you can pop by and check them out!